Painting animals has always been my passion. Since early childhood I’ve felt a very deep emotional, almost spiritual empathy for nature that I have always tried to convey in my artwork. Weaving silently through dark trees and the cover of rock and shrub, she moves gracefully towards a spring, cautious and methodically searching. Then, upon a first glimpse of possible prey, a visceral reaction of flowing saliva and dilating pupils and she freezes motionless and breathless so not to warn of her presence. With unrelenting focus, every movement calculated, and, every advantage of cover taken, she begins the stalk. They gallop for sheer joy with nostrils flaring red and eyes wild in mock fear, playing at dominance with a ferocious countenance and pounding hooves. Finding comfort in strength and speed, and, the closeness of their kind, the young stallions, with a fierceness of longing pounding in their hearts, and, surrounded with forage from horizon to horizon, still hunger at the scent of wild grass just over the next hill. I can feel them as if I am one, living as they do. I use that fantasizing to come up with ideas for new paintings. Horses were always my favorite and are still my most beloved muse. I paint many, many horses, some portraits of someone’s beloved pet, but, most are just figments of my imagination that paused long enough in their wanderings through my grey matter for me to capture them in oils, or, graphite. I’m influenced by all I see about me, things I see, hear, or, read about, and, my inspirations may come from totally unrelated sources to the subject of my painting, but, they somehow spark an image that I may prod and work around in my mind until I have to put it to paper, and, maybe if it is strong enough, to paint. I have been able to draw animals ever since I could pick up a pencil. Everything I do, including painting, is self taught. I have never had an art lesson in my life. I am not exactly sure how I came to it, but I know it was natural. Its something I have been doing for most of my life. As a kid, I grew up on my grandparents farm, where I was constantly around them. I would draw some the animals that lived on the farm. Others, I would make up on my own. As I got older I got involved with 4H. Where I was allowed to exhibit and show my artwork. I earned quite a few ribbons, honorable mentions, and even a couple of best in shows just by exhibiting at the fair every year. Now that I am out of 4H, I show animal art at three local county fairs in the fall in their open class exhibits. It’s a lot of fun, and helps me keep things new and interesting since a lot of my work is done to compete in their classes. I have also earned a couple of best in shows, and a best in division just by showing in the animal sections. Getting involved with EBSQ and Ebay groups like Art for Critters, and Animal Loving Artists has also helped me keep things fresh and new. The weekly and monthly challenges are a lot of fun. Some of the proceeds from the art sales do help benefit the animals. They are my favorite subject to draw and paint. I find them to be very challenging, unique and beautiful creatures to capture on canvas. Red Fish - Robert Wolverton Jr.
First of all I like to get inspiration from the things I like to do, which is fishing, camping, mountain biking, etc. I like to observe all the animals that you see and watch just how funny and people like they are. When painting my fish I try to transport myself to that stream and hear the babble of the brook and the smell of honeysuckle and the chirping of the birds. 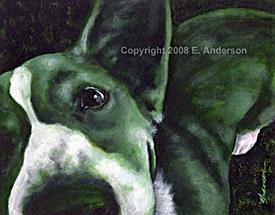 When I paint my pet portraits (usually dogs) I try to get to meet the pup if possible and get to see them in action. Capturing their attitude and spirit is important, this can be done as well by the owner’s description. All animals are different, just like people, and I like to focus on the individuality of each animal. The best part of painting wildlife is actually not the painting itself but the time spent getting inspiration in the outdoors. – Robert Wolverton Jr.
Frankie has shared a connection with animals since growing up on her grandparents ranch as a kid and having many animal playmates. It is her love of animals that compels her to capture their beauty. My deepest love from a young age has been with the magnificent animal, the horse. Most of my life has been devoted to the equine and a continued love and learning, owning, riding and caring for them. The very soul of the horse, his heart, his mind, his bravery, and his loyalty can be seen in his eye. The sweet nuzzle from his soft nose, a gentle lick from that silky tongue searching for a sugar cube, the nicker you hear when he sees you opening the back door to come to his pasture or stall, makes for a lifetime of wanting to know more about this wonderful creature. This love is what I hope my paintings portray. 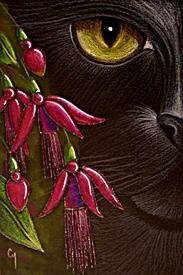 My paintings of dogs and cats and other animals comes from the pure desire to share their beauty to the viewer. Maybe one painting will capture someone’s heart and a kindness will ripple on to be kind and caring for all animals. I strive to capture that innocense of the animal kingdom. We are their caretakers. Look for other Animal & Wildlife Artist profiles later this month!